Only a longtime Rohit Sharma fan can effectively exploit both his greatness and his inconsistencies to their own profit. And only a true Rohit Sharma fan can go so far as to romanticise the greatness of his inconsistency. 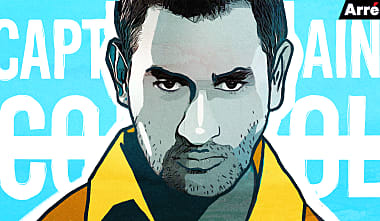 hree weeks ago, Rohit Sharma became the captain of my team. Lofty metaphorical connotations aside, I took a second to cherish this moment. I scrolled through my friends’ IPL Fantasy League teams in our group. And sure enough, everyone else had dropped him by then. Mumbai Indians had begun their campaign with three consecutive defeats, and Rohit had failed in all of them. Who could blame them? But this was my cue. I clicked on the “add” button minutes before the match. Two hours later, Rohit had smashed a chanceless 54-ball 94. No, I’m not a spot-fixer, but in cricketing terminology, someone far worse: I’m a Rohit Sharma fan. Ironically enough, Rohit’s knock came against a team whose leader knows exactly what it is to be a Rohit Sharma enthusiast. The Royal Challengers Bangalore captain, Virat Kohli, routinely recognised as the best batsman in modern-day cricket, didn’t look the least bit surprised as he watched one of Rohit’s five non-violent sixes sail into the stands. He, in fact, looked like a man who had confidently dropped the RCB bowlers from his own Fantasy League squad before the toss. There was, after all, an air of inevitability about this innings. Fantasy League Sports is a game of calculated uncertainty and dumb luck. You never really know which player will click on what day. But there are two uncalculated certainties in Indian cricket: a Kohli stunner in a chase, and a Rohit outburst after four low scores. As I so proudly and tragically proved that night, only a longtime Rohit Sharma fan can privatise the precise inconsistency of his greatness. And only a true Rohit Sharma fan can go so far as to romanticise the greatness of his inconsistency. It is an art to be a Rohit Sharma fan in the era of Virat Kohli. Back in April 2007, West Indies batsman Brian Lara retired from international cricket. I distinctly remember the emptiness after he was run out against England in his final World Cup match. One of the game’s most flamboyant entertainers – my childhood hero – had vacated the stage. I had cherished him, for better or worse, far before the “flawed genius” narrative became a pop-culture staple. Despite his bona fide superstar status, he was an underdog for most of his career. Nobody expected a thing from his West Indian side. This made his batting a thing of beauty. With every gravity-defying back lift, Lara was straddling the void between a glorious history and bleak future. Perhaps it was a nostalgic affection for those embroiled in an uphill struggle that, merely five months later, attracted me to a 20-year-old Mumbai batsman in an inexperienced Indian lineup at the inaugural ICC World T20. India was in tatters after the disastrous World Cup, still reeling in the aftermath of the Greg Chappell rule. Nobody expected a thing from the unfamiliar Dhoni-led side in South Africa. It was in these ashes that I chose to identify a spark – a spark that, over the next decade, would repeatedly thrive on extinguishing itself to highlight its sporadic brightness. I was vulnerable, and an unbeaten half-century against the hosts in a do-or-die game on a hot, sultry night triggered my illicit rebound with the man they called Rohit Sharma. Eleven years later, we are still together – older, but no wiser. I wouldn’t call it an abusive relationship; it is, however, a troubled one. It’s never easy to be with someone constantly in the limelight. He is ridiculed quite often, and even his self-destructive phases defy convention. Unlike Lara or Tendulkar in the ’90s, Rohit hasn’t had the luxury of playing for a mediocre team. As a result, he has had to manufacture the aura of victimhood in order to convey his “underdog” strength. Like Rockstar’s Janardhan Jakhar (Ranbir Kapoor), he has had to personally produce the idea of pain to propel himself to unconquered heights. For instance, he insists that if it weren’t for the self-inflicted heartbreak of not being selected for the 2011 World Cup, he wouldn’t be the ODI record breaker with 3 double centuries he is today. Fair point. Ask Bruce Wayne or an Imtiaz Ali protagonist – it’s too boring to be the reliable white knight. While most players go through prolonged phases of bad form and purple patches, Rohit infuses the narrative arc of an entire career into a single tournament. Every time he comes into a series, he is either a rehabilitated champion or his credentials are at stake. Every time he scores a hundred, commentators invariably use the words “return to form”. He seems to be perpetually silencing his critics rather than furthering his legend. When he celebrates a milestone, there is mostly a tone of tortured relief – the “I can’t be back because I was never gone!” look – in the way he punches the air. Only a true Rohit Sharma fan can go so far as to romanticise the greatness of his inconsistency. Take, for example, India’s recent tour of South Africa. Rohit entered as a reputed and feared opener, primed to break his overseas hoodoo. By the fifth of nine limited-over matches, he was again being labeled a one-dimensional home bully. He promptly scored a century – as a lost hope, battling some masochistic sense of existentialism – and then failed for the next four innings. He started the tour a hero and ended it as Rohit Sharma. It is an art of sorts, to create this illusion of endless survival, to make the ladder you’re scaling steeper than it is by falling more often than you rise. It’s an art to make onlookers fully appreciate each century, each front-foot trigger movement, each predetermined charge, only because they don’t know when the next one will come. It is an art to be a Rohit Sharma fan in the era of Virat Kohli. Loving him unconditionally has its advantages, too: I’ve learned to embrace the virtues of patience and tolerance. I have learned to value the good times, and the most fundamental meaning of the phrase “the night is darkest just before the dawn.” Most importantly, I’ve learned that dawns are brief but gorgeous. Marat Safin fans might know the feeling. When Rohit annihilated the one-day record books at Eden Gardens, as when Safin defeated Federer at his peak in Melbourne, the elation becomes special because of the frustration that precedes it. The allure lies not just in their inability to live with such explosive promise, but also their ability to occasionally – fleetingly – capitalize on it. It lies in their power to show you what is possible, to compel you to end debates with an “on their day” disclaimer, and then in their consequent unwillingness to have more such days. They exist as trailers of sporting perfection, and as simultaneous reminders that those who are blessed with genius are also cursed with it. That night, moments after Mumbai Indians’ first victory of their season, I quietly clicked on the ‘remove player’ button of my Fantasy League page. Rohit Sharma scored a paltry 81 runs, including two ducks, in his next five innings. I couldn’t help but smile. Even when he lets me down, he only vindicates my faith in him.